At the end of UNLV’s game with TCU on Friday night, Runnin’ Rebel guards Jalen Poyser and Kris Clyburn both wore large bandages above their left eyes courtesy of a couple of stray Horned Frog elbows. But the most painful wounds suffered by Marvin Menzies’ squad were self-inflicted. Freshman guard Desmond Bane scored 15 points and junior guard Kenrich Williams grabbed a career-high 18 rebounds as TCU remained unbeaten in the Jamie Dixon era with a 63-59 victory over in the semifinals of the Global Sports Classic at the Thomas & Mack Center. The Horned Frogs (5-0) will play Washington (4-1), a 86-47 winner over Western Kentucky, in Saturday night’s championship game at 7:30 p.m. while the Runnin’ Rebels will face the Hilltoppers (3-2) in the consolation game at 5 p.m. Junior forward Vladimir Brodziansky finished with 14 points, including a pair of free throws with 26.2 seconds left that gave the TCU a 61-55 lead and proved to be the game-winning points. 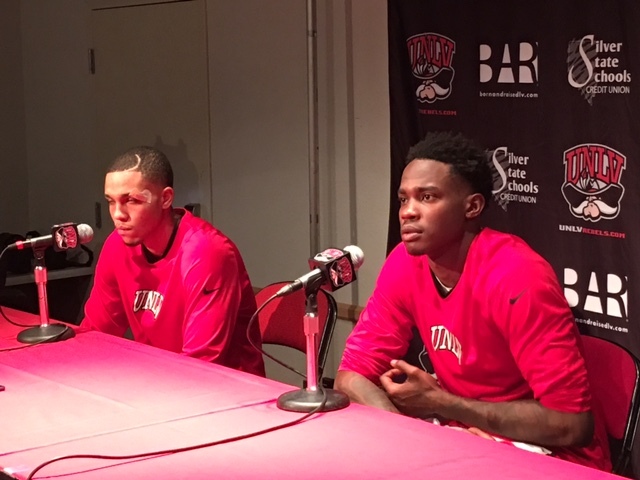 The loss snapped a three-game winning streak for the Runnin’ Rebels (3-2). HOW IT HAPPENED: UNLV, which connected on five of its first six 3-pointers, jumped out to a 16-6 lead and led 19-12 after nine minutes. But TCU answered with a 12-0 run as the Rebels went almost six points without a point and went into halftime a 30-27 halftime lead. The Horned Frogs, who led by as many as seven points midway through the second half and won despite making just 15-of-28 free throws (53.8 percent), sealed it on a free throw by freshman guard Jaylen Fisher with 7.9 seconds to go. TCU finished with a 42-39 rebounding edge including 13 offensive boards that resulted in a huge 19-9 edge in second chance points. WHO STOOD OUT: Poyser scored a game-high 19 points, including 4-of-7 3-pointers to lead UNLV while junior forward Dwayne Morgan added 13 points and seven rebounds and senior forward Tyrell Green finished with 10 points, including 2-of-3 3-pointers. QUOTE TO NOTE: “Obviously that was the telltale stat for us. It was bad execution in winning time. We talk about winning time … tonight’s winning time was losing time. … There were a couple of those turnovers late that were just on us. We’ve just got to do a better job of taking care of the ball.” – UNLV coach Marvin Menzies on his team’s 19 turnovers. UP NEXT: The Runnin’ Rebels will play Western Kentucky, a 86-47 loser to Washington earlier Friday night, in the consolation championship Saturday at 5 p.m. at the Thomas & Mack Center. NOTABLE: Senior forward Christian Jones, UNLV’s leading rebounder and second leading scorer, and 6-foot-11 freshman forward Cheickna Dembele both missed their second straight games with a foot injuries. Menzies said both would miss Saturday’s game and that Jones could be out several weeks. … Highly touted TCU freshman guard Jaylen Fisher did not start for the first time this season after getting sick on the team’s flight to Las Vegas. Fisher, who originally signed scholarship papers to attend UNLV but reopened his recruiting after then head coach Dave Rice was fired in January, was booed each time he touched the ball. Fisher finished with seven points and three assists in 24 minutes of action. … Rebel guard Jovan Mooring finished with zero points on 0-of-5 shooting and had six turnovers in 22 minutes of action.